Establishes Milagros de Mexico as a Community Resource for Healthcare Information within US Hispanic Communities. 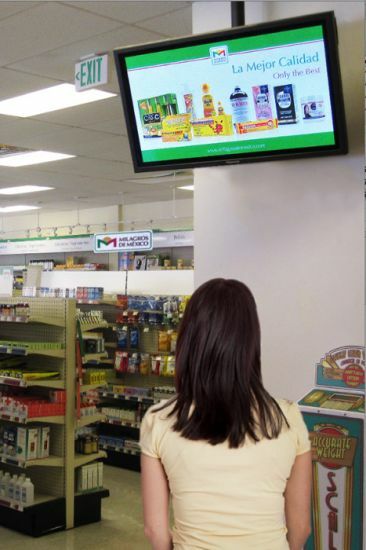 When you think about your neighborhood pharmacy, your first thought probably isn't of high- definition screens playing informative and engaging health-related video messaging and branding - unless you happen to live near a Milagros de Mexico (MdM) Pharmacy. A completely bilingual and bicultural retail pharmacy chain with a small-town feel, MdM provides health and wellness products to the established Hispanic neighborhoods of San Francisco, San Jose, Oakland and Redwood City. In addition to offering a broad selection of U.S. and Latino brand medicines, supplements and homeopathic remedies, it also offers a wide range of affordable medical services. MdM wanted a cost-effective solution for differentiating its stores from the larger chains by providing their communities with much needed, health-related information that entertains. Management also wanted to deliver timely messages about the stores' extensive product and service offerings so customers would be able to make well-informed decisions. By combining BrightSign® network-enabled HD210 digital signage players with Wovenmedia's place-based media services, MdM now delivers professionally-produced health and wellness segments from leading television networks, as well as their own content, throughout the chain of stores.